Anadarko call Animal Birth Control Clinic: 580-355-6985. 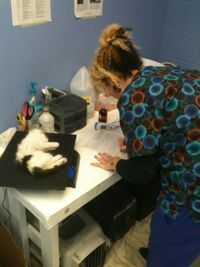 Most of these programs are priced at $35 per dog and $25 per cat., plus $5 for rabies. Many have a sliding scale in place for those unable to afford those prices. Sliding scale (below $35/ $25) is variable depending on available funds. Most programs require income eligibility. Most of these programs are staffed in all or part by volunteers, please allow up to 72 hours for response to calls for appointments. Appointments are necessary at all of these programs. All locations in Oklahoma are welcome to use transport in order to access programs in Tulsa, OK City, Lawton, and most locations served by mobile units. Many welcome feral cats, but we know of none able to assist with cost of feral colonies, so they are $25 per cat. For further animal friendly references including sheltering, foster care, legislative alerts and more, call Oklahoma Humane Federation at 918-336-0442.